Sometimes you have to look back to see how far you’ve come. From our early days in butter and eggs, our transition into cheese-making, and our many expansions and innovations since, we’re proud of our history. In fact, one could even say that pride is the most important ingredient in the products we make. We are 400+ patron dairy families strong, with each of our member farms committing 365 day a year to producing the highest quality milk. And then there’s the dedication of our cheesemakers, production and packaging team, putting out the best product possible. It’s that sense of pride and commitment that makes our cheeses taste so good and making us dairy proud for over 100 years. Milton Dairy Company of St. Paul, MN erected a creamery in East Ellsworth, WI, on the Old Mill site near the railroad depot. 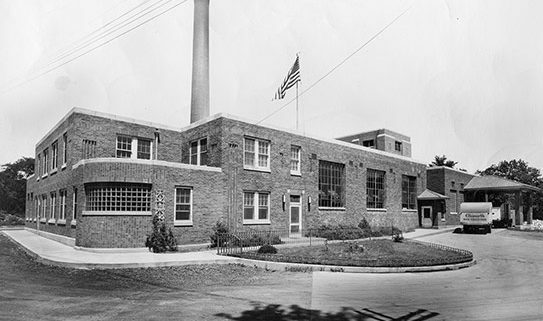 It was a large central churning plant, equipped with the day’s most modern machinery, to make butter in small packages for their retail trade in St. Paul, MN. Thirty farmers met at the Ellsworth Town Hall and organized the Ellsworth Butter and Egg Company. $500 was raised on the spot to help finance the new company. The Ellsworth Butter and Cheese Company became a cooperative and bought out the Milton Dairy Company. It’s important to note that the term cooperative had a different meaning at that time – anyone could have stock in the company, including professions other than farming. Today, only farmers can hold stock in the company. Henry O Melgaard was the first butter maker hired at the Ellsworth Creamery Company, working here from 1912 until sometime after 1940. He learned the trade from Jens Bjerking, who learned the trade at home in Norway before immigrating to America. Henry won several competitions throughout the state for “best butter”. Pictured here is Henry and Hilda (Swenson) on their wedding day, May 21, 1913, in front of the Pierce County Courthouse in Ellsworth. 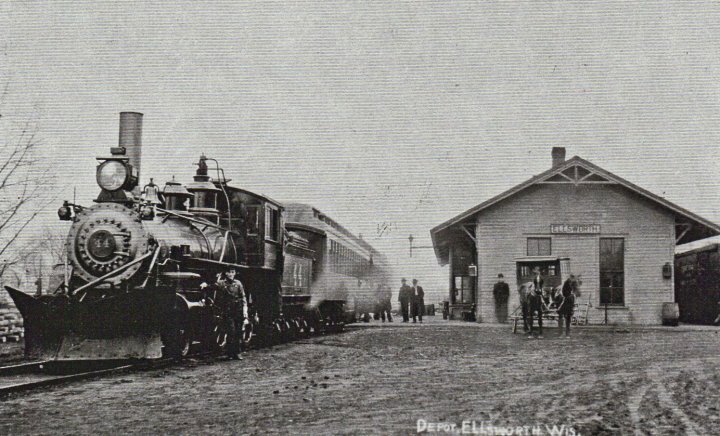 Because of the large amount of butter shipped by the Ellsworth Creamery Company to New York, six special refrigerated train cars were at the service of the Creamery. The lettering on the broadside of the cars read: ELLSWORTH CREAMERY COMPANY, ELLSWORTH, WISCONSIN, MANUFACTURERS OF PURE WISCONSIN PASTEURIZED BUTTER. 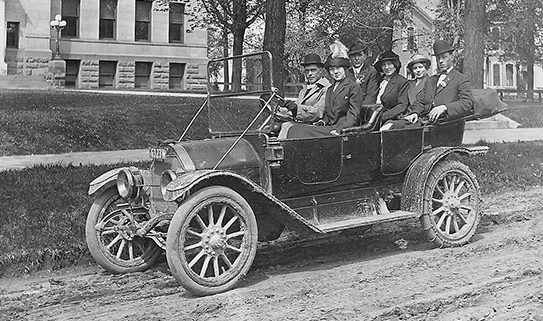 A full carload of butter from the Ellsworth Creamery was shipped every week to New York, making annual shipments of over a million pounds. 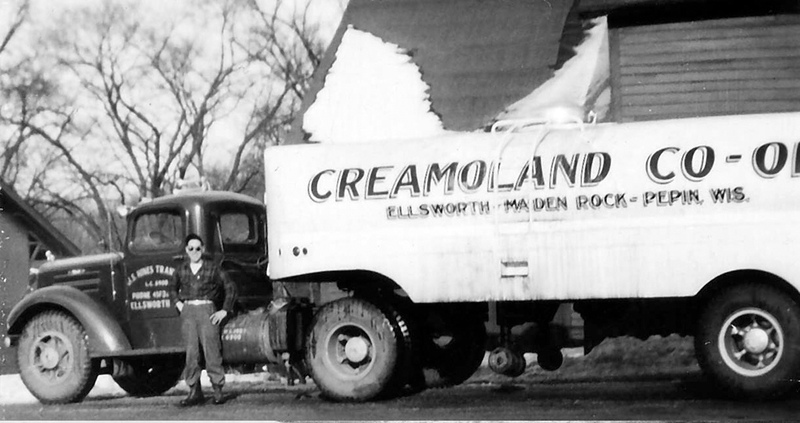 The Ellsworth Creamery Company became a Cooperative with new and updated by-laws. 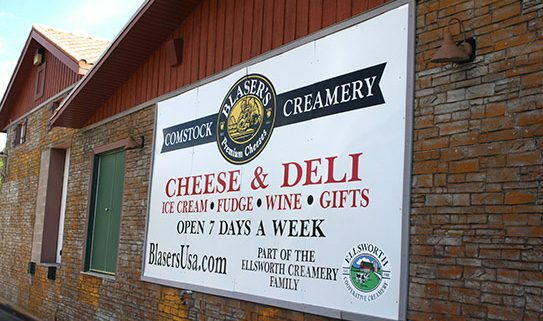 The Ellsworth Cooperative Creamery bought back any of the original stock held by retired farmers, businesses and estates. 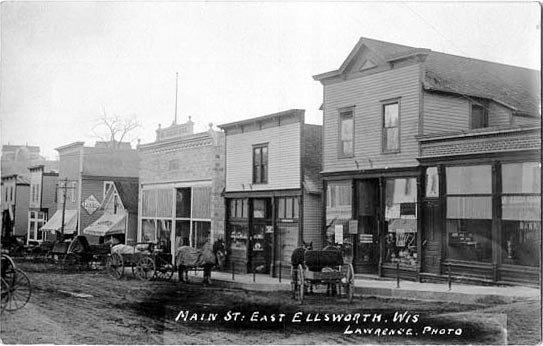 The Lawton Creamery was merged with the Ellsworth Cooperative Creamery, and in later years Maiden Rock, Pepin, and Prescott were added. Each patron was issued one share of common stock or revolving fund certificate, or both, as evidence his equity in the total retains accruing during the preceding year. A resolution was passed that the Maiden Rock, Pepin, and Lawton plants were no longer needed as an integral part of the operations of the Ellsworth Cooperative Creamery. These plants were later sold off at a time that it was advantageous for the company. It was voted to investigate getting into the manufacturing of cheese. 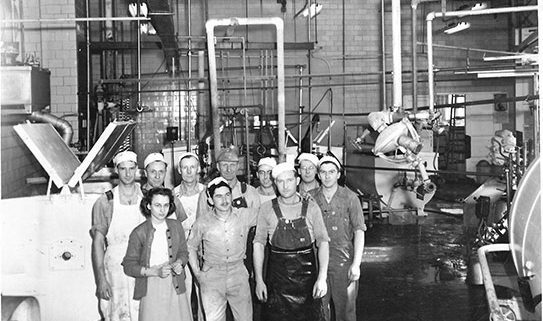 A cheese factory was built at the Ellsworth Cooperative Creamery location. After finding efficient equipment for the cheese factory, it was finally up and running producing cheddar cheese by the pound and cheese curds. Popularity of the new squeaky cheese was instantaneous and our all natural premium Cheddar Cheese Curds quickly became our specialty product. After one year a new warehouse needed to be built for cooling cheese. The Creamery set up their own whey-drying plant after discovering there was a market for it for bakeries and manufacturers of ice cream, milk drinks, and animal feeds. The system was the first high-tech whey system in western Wisconsin. It was able to lower manufacturing costs and eliminate use of plastic liners and paper bags. 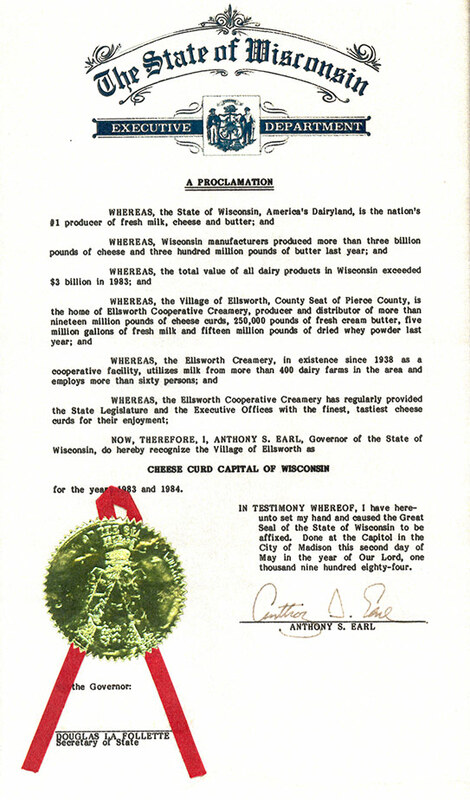 Anthony S. Earl, the governor of Wisconsin, declared Ellsworth the “Cheese Curd Capital of Wisconsin”. Ellsworth Cooperative Creamery started distributing cheese curds for retail sale. Now consumers could purchase cheese curds conveniently from the dairy case of their local grocery store. Ellsworth Cooperative Creamery became an international company through exports of dry whey powder to China. In 2011, a new chapter was written in our history book when Comstock Creamery in Comstock, WI, joined the Ellsworth Creamery family. For cheese lovers, this was a marriage made in heaven. The acquisition brought with it expanded cheesemaking capabilities and today we produce 80 varieties of specialty cheeses under the Blaser’s, Antonella, Kammerude and Ellsworth Valley (rBST, rBGH-free) labels. To address specific needs within our packaging process, Ellsworth Cooperative Creamery invested in our first ever automated packaging equipment. With the growing popularity of our Ellsworth plant’s signature product, we thought it was time. Ellsworth Cooperative Creamery trademarked “Cheese Curd Capital” to formally protect the designation bestowed upon us in 1984.